This impressive antique early George V English 9ct yellow gold jug has a traditional claret jug form. The underside of the pouring lip is embellished with chased bead decorated interlacing scrolling strapwork and ribbon designs accented with floral motifs. The shaped rim of the jug is ornamented with an impressive applied bead decorated border. The knopped cylindrical neck and pedestal are each encircled with a band of shaped quatrefoil motifs and applied bead ornamentation. The knop to the neck is amidst fine rope twist decorated borders above a band incorporating an interlacing ribbon design. The decoration to the magnificent ovoid body of this large jug incorporates an impressive shaped cartouche with the contemporary bright cut engraved initials ‘GC’ above an inscription to one side. The other side of the body is embellished with a finely chased decorated variant of the scene from the illustrious 19th century painting 'The Birth of Venus'; with nymphs and male figures playing musical instruments, surrounding a central figure draped with swags of fabric and beads emerging from a vast water scene, with a child resting upon a dolphin at her feet and putti to the sky. The body of this gold jug is further adorned with fine chased shaped scrolling strapwork designs accented with bead decoration and interlaced with quadrilateral bead ornamented S scroll bands incorporating stylised scrolling leaf motifs with geometric elements. This fine presentation piece is further ornamented with an exceptional chased bearded mask applied over a chased stylised olive leaf branch, below the lower socket of the handle. The lower portion of the body is encircled with fine and impressive acanthus leaf decoration. The fine and impressive ribbed bamboo style handle is encircled with a band of bead decoration to the upper portion. The stepped circular base is embellished with bands of fine and impressive bead decoration above a chased zigzag geometric design. * Our silver/goldsmith has confirmed the inscription can be removed if so desired. This can be done via erasure or applying a gold plate. We would be happy to meet customer requirements. 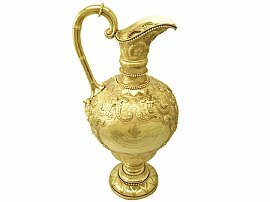 This impressive antique claret jug is an exceptional gauge of gold, exceptional quality and in exceptional presentation condition. Full hallmarks struck to the side of the pouring lip are all very clear. Reflections in photographs may detract from the true representation of this impressive early George V piece. Height to top of handle 53.2cm/20.8"
Length from back of handle to lip 23cm/9.1"